Keratoconus is a disease where the front part of the eye, the cornea, begins to transition from its normal, round shape into a thinner, cone-like structure. The cone distorts a patient’s vision in a way that traditional glasses and contact lenses cannot correct. Keratoconus typically presents in teenagers to young adults and may continue to progress over 10-20 years. While there is no cure, early studies suggest that “collagen cross-linking” surgery may successfully slow disease progression. A handful of corneal specialists in the Chicago area currently perform this “yet-to-be FDA approved” procedure; please contact me if you would like more information. So, if glasses and regular contacts do not help, what are my other options? Traditionally, once a cone started to interfere with vision, we would need to design a custom Rigid Gas Permeable (RGP) contact lens. This lens would essentially wrap perfectly around the cone and re-create a smooth, spherical surface at the front of the eye. There are a number of designs and RGP materials available. In most cases, I find that patients can tolerate the ComfortKone lens from Metro Optics. Although the materials are constantly improving and becoming more “breathable,” these lenses are physically rigid, and as a result, many patients experience considerable discomfort that worsens throughout the day. Another solution is to “piggyback” the RGP lens on top of a soft contact lens, or to wear hybrid lenses, which combine both soft and RGP lenses together. However, these methods can be costly, uncomfortable, and prone to significant complications. Fortunately, a new, custom-designed, soft contact lens is available for patients with Keratoconus called Kerasoft IC. 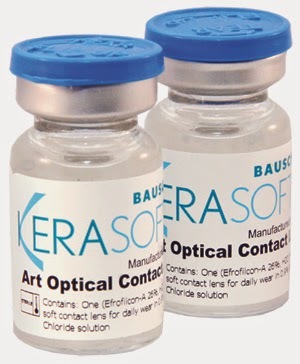 Kerasoft IC is ideal for patients that are unable to tolerate conventional soft contacts or experience discomfort with rigid gas permeable contacts. I am proud to be one of the few optometrists in the North Shore licensed to prescribe these lenses. Can you tell me more about Kerasoft IC contacts? The Kerasoft lens is the first (and only) soft lens that is custom-designed to fit nearly any cone or irregular cornea. The contact is a highly breathable, disposable lens that lasts approximately 3 months. The cleaning regimen is simple and only requires BioTrue contact lens multipurpose solution, an over-the-counter product. The initial fit typically takes between 30 minutes to an hour. The doctor will use multiple lenses from a diagnostic fitting set, which is only available to certified practitioners, and a subsequent refraction will also be performed. Other imaging parameters, like corneal topography, will be taken into account to help create the optimal lens. The finalized contacts arrive within a week, and once the perfect fit is confirmed, the patient may order an additional one year (4 pack) supply. Given the nature of Keratoconus, gradual changes in corneal shape may require future adjustments to lens fit and prescription. The costs of an initial Kerasoft IC fitting and annual supplies are comparable to older, custom RGP lenses. In a patient diagnosed with Keratoconus, many medical insurance and VSP vision plans will cover the majority of the cost associated with these custom lenses. However, please contact your health insurance and/or vision plan to ensure eligibility and coverage. How do I see if Kerasoft IC lenses are right for me? If you have Keratoconus, simply ask your eye doctor if they are a certified provider, or use the “doctor locator” feature on the Kerasoft IC website.